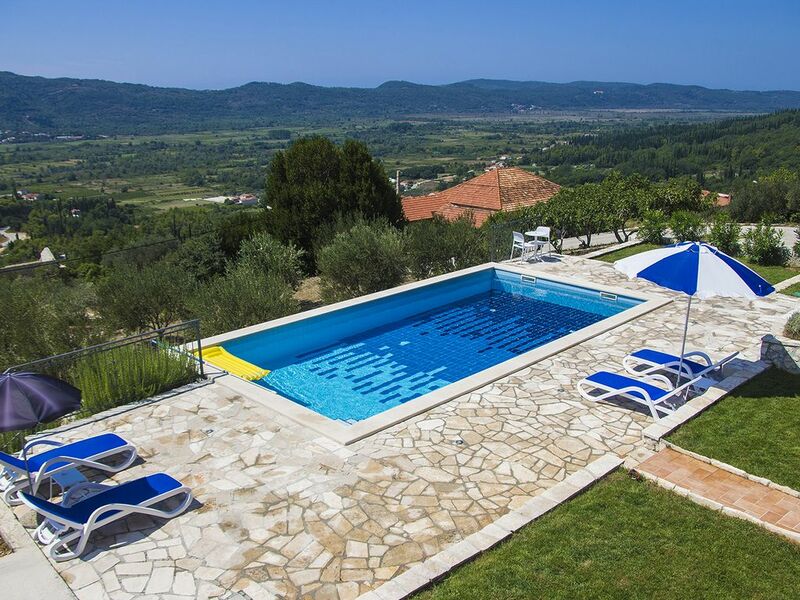 Villa Oliva is a spacious two bedroomed self-catering apartment situated in Ljuta just 5 minutes' drive from Gruda, in the Konavle Region in the southern most part of Croatia. A 15 minute drive from Dubrovnik Airport, it is recommended that you hire a car for the duration of your stay to enjoy all the surrounding area. The fully furnished apartment forms the ground floor of a beautiful villa of which we hope will be completed by Summer 2021. For now, the apartment benefits from the use of the whole outside area with the large private swimming pool with beautiful views right across the valley with superb sunsets at night! A covered terraced area and a separate covered BBQ area with table and chairs and outside kitchen facilities are for the exclusive use of guests in the apartment. The apartment has one double bedroom with plenty of wardrobe space, a twin bed room with wardrobe and a good sized bathroom with shower, bath and washing machine. The living/dining area has a double sofa bed, dining chairs and table with a TV, DVD player and free Wi-Fi. A small kitchen with a hob and oven, large fridge freezer and plenty of cupboard space. Most of our guests enjoy dining al fresco during the warmer, summer months in the outside covered areas and can enjoy watching the sun go down on a beautiful summer's evening. The pool has sunbeds, parasols and the pool area also has an outside toilet and a good shower by the pool. There is also an outdoor table tennis table for use by our guests. The apartment benefits from a heating and air conditioning system through the property with shutters on all windows. All beds will be made up for your arrival and bath and beach towels are supplied. The pool will be cleaned weekly but guests are asked to use the outside shower before taking a dip in the pool! We try to be flexible on changeover days, but unfortunately for summer 2019 we are unable to offer a Saturday changeover. The Owner's speak fluent English and Croatian. Please note all building works on the upper part of the property are carried out during the winter months so the peace and tranquillity will not be spoiled during your the period that we rent out to guests. I was born in Croatia but have spent the last 22 years living in England with my husband and two children. It was always my dream to build a house on my family's land in Croatia. Although it has taken some years to build, we are delighted with our new home and hope that guests can enjoy the beautiful surroundings and house that we have built. The second part of the project is on-going and over the winter months we hope to transform the upper part of the property for ourselves and future guests to enjoy. The Konavle region is a rural region in the southern most part of Croatia with distinct character. A rocky coast on the south with mountains to the north and a beautiful green valley in between. Villa Oliva sits at the top of the valley with beautiful views for miles around, whilst benefitting from being so close to the airport, beach resorts and Dubrovnik. A perfect place to enjoy a varied and relaxing holiday. A unique opportunity to rent a two bed apartment with such a vast and beautiful outside space to enjoy. Two outside seating and eating areas with outside shower, outside kitchen and WC making life in the summer very easy to dine out "al fresco" style! Washing Machine and Hair Dryer. Double sofa bed. TV, DVD, Games. A covered seating area with comfortable wicker sofas and table outside the front door looking over the valley. A covered terrace area by the BBQ area with large table and chairs to seat up to 6 people. Fridge and outdoor sink. Plus a large terrace by the pool with plenty of space to sit. Large pool with sunbeds and parasols available with an outside shower and WC. The countryside village of Ljuta is stunning with its clear streams, stone buildings and fields of greenery. The remains of many water mills still exist along the river in Ljuta. Beautiful walks along the river and two fantastic restaurants along the river's edge. The Konavle region is a rural region in the southern most part of Croatia. The region is excellent for cycling, hiking, horseback riding and anything to do with nature. The Konavle region is also known for its many local restaurants serving genuine dishes from the region using fresh and local produce. The nearest village GRUDA in the valley below Villa Oliva is popular with tourists and has an excellent selection of local shops, supermarkets, bars and cafes with one of the best Pizza Restaurants in the area. The coastal town of CAVTAT (20 minutes' drive) which is on the Adriatic coast known for its beaches and many ancient buildings surrounding the beautiful harbour. Cavtat is the biggest nearby town with beaches, many excellent restaurants, bars and sunsets like you've never seen before. Half hourly boat trips run between Cavtat and Dubrovnik 7 days a week in high season or you can take the bus. CILIPI, just a 15 minute drive from Villa Oliva is the Folklore Centre of Konavle. Every Sunday at 11am from Easter to the end of October a traditional folklore dance is performed in the square in front of the St. Nicholas Church, surrounded by ancient buildings. POPOVICI - Konavle cliffs can be over 100 feet high and are particularly high near this village. A rocky, steep footpath leads to hidden sandy beaches (Pasjaca) cut into the bottom of the cliffs. MLINI located between Dubrovnik Airport and Dubrovnik has an excellent Hypermarket as well as a beautiful coastline where you can spend many a lazy day by the water's edge. Slightly further along the coast you can spend a relaxing day on the beach at Kapari where war torn buildings make for an impressive and surreal backdrop. DUBROVNIK - 34km (35 mins).